The All Due Respect website has consistently published good crime fiction from a wide range of new and established writers. 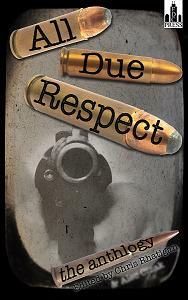 Chris Rhatigan has now taken that one step further with the release of the first All Due Respect anthology. First things first, in the interest of full disclosure I should mention that have a story in this one, but let’s ignore that. There are 28 other writers to choose from here and I don’t see why they should all suffer on my account. Featuring some of the best from the website and a truck load of brand new stuff, All Due Respect - The Anthology has brought together stories from some of the most exciting authors currently working in short crime fiction. Many of these guys and girls are no stranger to the Gutter; a few of them even work here. This is the kind of fiction that doesn’t make apologies. The prose here is armed and dangerous. The stories range from hard-boiled nut-busters to dark, gritty noir. Take it from me you’re going to get bloody on this one. There are plenty of dark alleys and dive bars for you to explore where you will find a star studded cast of dope dealers, hustlers, strippers and stone cold killers. These crime stories are all from the top draw; a couple of my favorites were Matt Funk’s razor sharp “His Girl” and Jim Wilsky’s classy corporate tale, “Severance.” But for me, the jewel in this particular crown of crime is “Day Tripper,” by the Gutter's own Joe Clifford. Joe tells us of the marginalized and the disaffected and he does it better than anyone I know. His story alone is worth the price of admission. This anthology is ideal to dip into when you need a quick fix of noir or if you prefer, you can lose yourself in it for an afternoon; either way you’re guaranteed a shot of the good stuff and at around a buck on the Kindle, this should really be a no brainer.